Once used as a royal signature, monograms are now ways to personalize just about anything from swimsuits (yes, I have one) to towels to totes and jewelry. 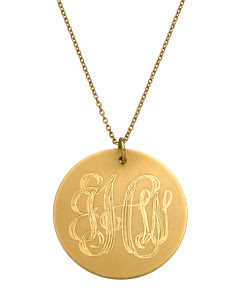 Emily & Ashley makes an amazing, amazing gold disc pendant, but at almost $800 it's sadly out of my price range. However, you can get a custom gold disc necklace made on (where else) Etsy! 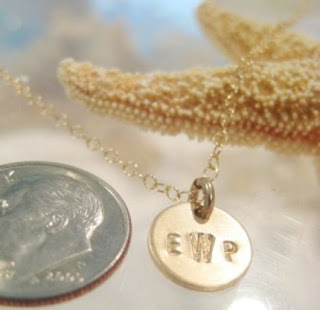 The lettering is more modern and the disk is toted as being a "baby," but on a pretty thin gold chain you have a great alternative (at $26.50!! ), and a great layering piece if you ever do get the Emily & Ashley one. To purchase the Etsy gold disc, click here.